Dinlos and Skilldos: Nelson - British Comic Award winner! 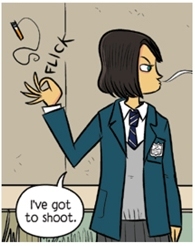 Nelson - British Comic Award winner! 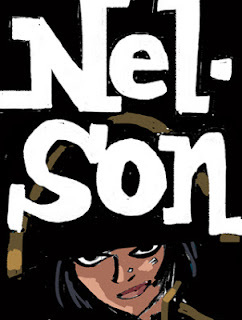 The original colour rough I did for Nelson from Woodrow's type rough back in December 2010. Last month Nelson won the first British Comic Award for best book and I want to congratulate and thank everyone who contributed to the book. I would have liked to do that when Woodrow and I picked up the award, but it's a long list and it would have taken quite a while. Here goes. Thanks and congratulations to Kenny Penman (our publisher) Woodrow Phoenix (my co-editor), Paul Grist, Ellen Lindner, Jamie Smart, Gary Northfield, Sarah McIntyre, Suzy Varty, Sean Longcroft, Warwick Johnson–Cadwell, Luke Pearson, Paul Harrison–Davies, Katie Green, Paul Peart–Smith, Glyn Dillon, I.N.J.Culbard, John Allison, Philip Bond, D’Israeli, Simone Lia, Darryl Cunningham, Jonathan Edwards, Ade Salmon, Kate Charlesworth, Warren Pleece, Kristyna Baczynski, HarveyJames, Rian Hughes, Sean Phillips & Pete Doree, Kate Brown, Simon Gane, Jon McNaught, Adam Cadwell, Faz Choudhury, JAKe, Jeremy Day, Dan McDaid, Roger Langridge, Will Morris, Dave Shelton, Carol Swain, Hunt Emerson, Duncan Fegredo, Philippa Rice, Josceline Fenton, Garen Ewing, Tom Humberstone , Dan Berry,Alice Duke, Posy Simmonds, Laura Howell, Andi Watson, and Dave Taylor (the contributors) and Bridget Hannigan, Kayla Hillier, Martin Steenton and Geri Ford (for everything from pulling the project together, proofing and colouring to publishing it). I also have to thank my partner, Rachael, whose conversation with her sister inspired the final chapter of Nelson at a time when I had no idea how to end the book and who, on our first 'proper' date, took me to the Nelson in Blandford Forum. Coincidence or fate, don't know that I believe in either. She had no knowledge of the book and on that day as we sat there getting drunk in the beer garden with the rough script notes under a pint glass to stop them blowing away I knew this was just meant to be. And I had an idea for a single image prelude to the story that was eventually drawn by Paul Grist and which is now hanging on mine and Rachael's wall with the date of that drink at the Nelson written underneath. Summer 2011 in London, the whiff of riots and Murdoch in the air. Nelson started life at Thought Bubble festival in 2010 when I realised that what makes the British comic scene of today is its diversity and harmony. Perhaps it's the nature of the Thought Bubble that it levels things and makes there appear to be no headline acts or star turns just a panoply of creative talents in the same room. Maybe it was a trick of the light and we all exist in cliques with our own agendas, I think Nelson says otherwise. At Thought Bubble 2011 we launched the book and everywhere I looked people were walking around with it under their arms. So it felt right that if Nelson was to win an award it should be at Thought Bubble 2012. 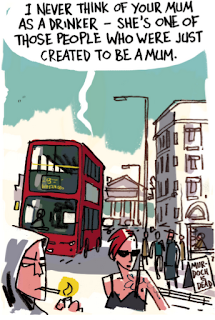 There's been some discussion since those first British Comic Awards about agendas and cliques and sexism. Primarily a few creators, Nelsonites among them, questioned whether there were enough women on the shortlist, no one covered themselves in any glory as bruised egos produced curt responses, which is the nature of Twitter based debates among friends. Unfortunately The New Statesman, which has an agenda to expose 'sexism in nerd culture', leapt on the debate and hitched it to this agenda. I have no problem with such an agenda, I'm not sure what nerd culture is, but if there's sexism at play I of course want it exposed for what it is. I say unfortunately because I would have been overjoyed for the New Statesman to do a piece on The British Comic Awards and from my perspective Nelson embraces so many positive issues that I have in common with them that it would have been great promotion for British comics' creators. What's done is done. I hope the Awards committee are open to criticism and are aware of all forms of bias that may influence voting, but I say that with no proof that this wasn't already the case. I'm sorry if anyone came away from the awards with these concerns, I came away dazzled by seeing so many wonderful British comics flickering before my eyes on the big screen. I just realised that the awards were almost clean sweep for Nelsonites. We did try and get Raymond Briggs into Nelson at one point (he took the lifetime achievement award). and Luke Pearson took the Young Peoples Award for Hilda and the Midnight Giant. The shortlists included graphic novels, web comics, short form, long form, adaptations, factual books, fiction, humour, kids books, observational, sci fi, romance, hight art, low art, experimentation, traditional comics... a broad range that demonstrates how far British Comics have come in a few short years. I feel excited and privileged to be making comics during the most creative time there has been in British comics in my memory. 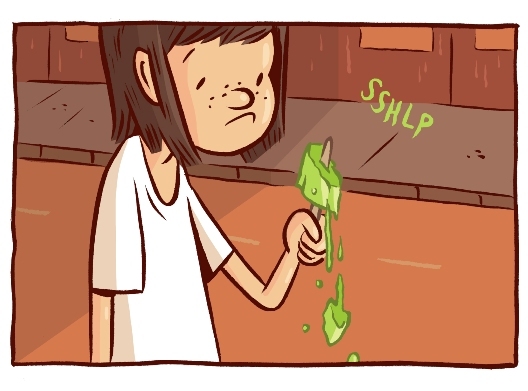 This is the time to be making comics in Britain, this is the time to be reading British comics! A soundly reasoned, and personal perspective. I'm proud to have been a part of Nelson.